My first trip to Vivec City was an unforgettable hour of confusion and awe. The Elder Scrolls’ cavalier attention to detail, both large and small, reached an apex there. Vivec is like a cramped cyberpunk cityscape, but it’s presented inside the brown sandstone of medieval fantasy. Eight floating stone pyramids comprise the city’s eight districts, with a network of gondolas and bridges connecting them to each other and the mainland. Each district has four explorable interior levels each, containing innumerable businesses and residences that house hundreds of named NPCs. They all have their own inventories, their own dispositions, jobs, haunts and hangs that combine to give each NPC their own personal little story. The fictional economy that supports these fictional lives is on full display–their houses, their businesses, the farms that grow their food and the sewers that funnel away their waste are not spared for detail. Administrative businesses, libraries, treasuries and offices take up space next to the rowdy taverns and ghastly magic shops. Vvardenfell, the massive island you explore in Morrowind, is one of the few sandbox maps that feels like it was built without any intention to turn it into game, as if it was designed and mapped to serve the lore more than playability. 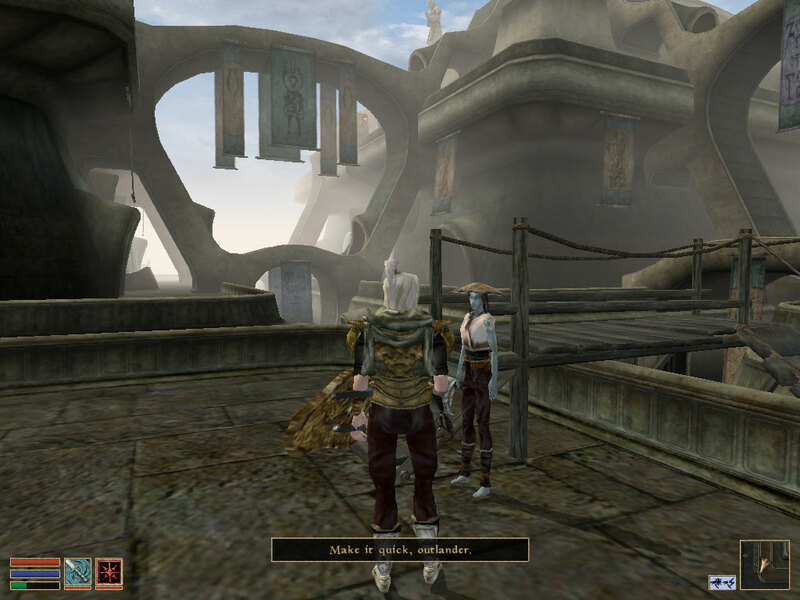 As far as the player’s lofty quests are concerned, all those administrative details behind Vivec City’s economy aren’t relevant. You can learn all about the process of how the nearby Netch farms churn out Netch leather which turns into Netch armor, and it’s only flavor text. There are almost two hundred different books to read (well, not really books so much are they are a few paragraphs, but still) that document everything from the world’s history to directories of the council members that currently lead its political parties. All this detail doesn’t really make or break the game, mechanically speaking. It’s just there. It’s flavor text the player can skip. But what this massive amount of detail does do well (and indeed, its very purpose to the game) is to reify Vvardenfell as a world that is almost as complicated, ancient and dynamic as our own. Look at how the game handles transportation for an example. Instead of pointing and clicking on a map screen to fast-travel (like in the TES games before and after Morrowind) you use Vvardenfell’s public transit system instead. The people of this island use animal mounts, ferry boats, and magic teleporter booths to travel around. So during the early game you use those facilities too. 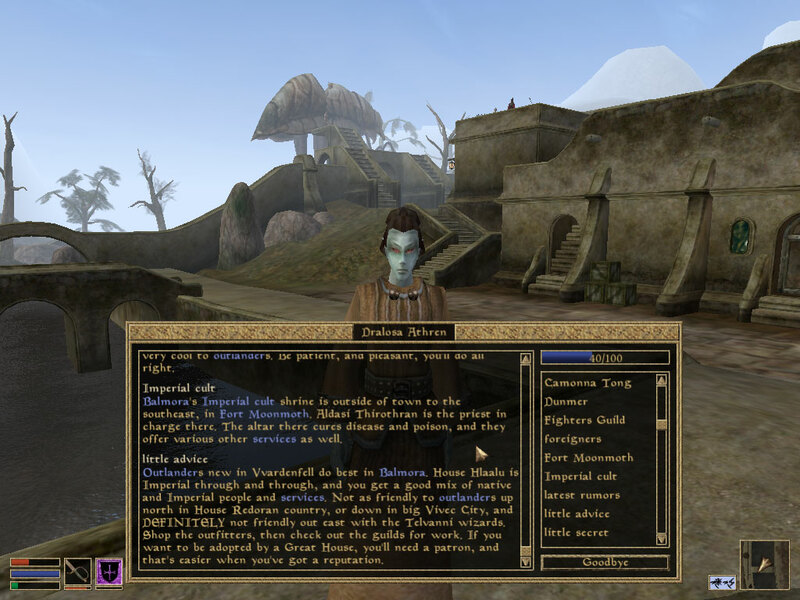 Critics during the game’s launch rightfully bemoaned Morrowind’s slow walking speed and constricting fast travel system, but those caveats serve as buildup for a divine payoff later on. They build anticipation for a revelatory moment that the player may not experience for tens or perhaps hundreds of hours later. Until then, Morrowind is a slow burning game. Transportation starts off slow. Combat starts off incredibly awkwardly. Since the world seems like it was designed before the gameplay was designed, it doesn’t lead you through roads and villages that are cleanly organized to funnel you in the right direction. The names are hard to pronounce, there are no omnipotent objectives prodding you this way or that way, and wherever you end up there will be just way too much stuff there. What gives you guidance is your own sense of adventure and a brilliantly self-aware main quest that tasks you with becoming the omnipotent God-king of Vvadenfell. 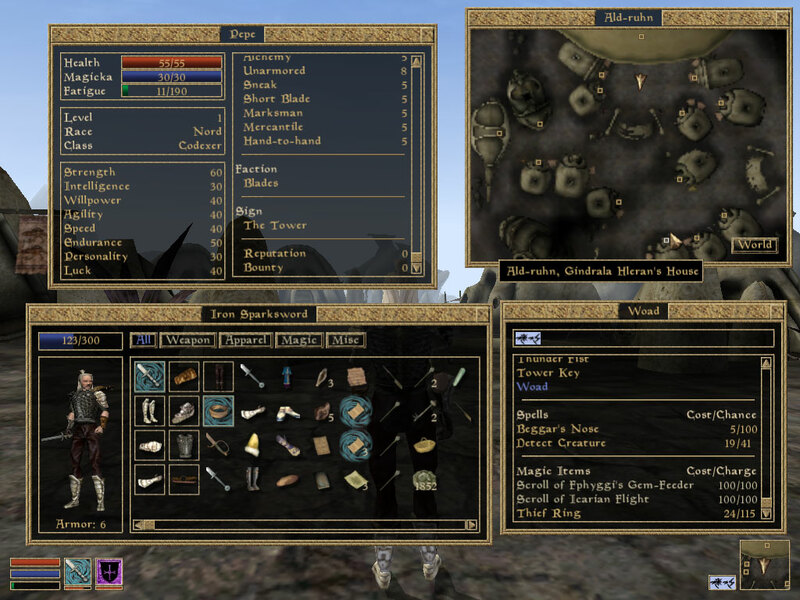 Eventually some overpowering stat progression happens after level 10 that makes combat and walking much more fast, and during that time your understanding of Vvardenfell will also increase immensely. You will come to learn the hard-to-pronounce names of its numerous towns and locations. You’ll get to know its tribes, its council members, its politics and its religions because the main quest tasks you with meeting and manipulating every last one of them. Soon you’ll be able to teleport across the map, fly from city to city, and sprint with blinding speed! You’ll forget about the public transit system because, just as all the flavor text of the main quest suggested you’d do, you’ll become a godlike warrior-poet who knows this island inside and out whether you were trying to pay attention or not.